Fashion Polish: 3 FREE Zoya starts Monday! Color Your World in 2013 with Zoya Nail Polish! 3 FREE Zoya starts Monday! Color Your World in 2013 with Zoya Nail Polish! Offer Valid Monday, January 7th (10AM EST) through 11:59 PM EST January 13th ONLY Pick3 bottles of Zoya Nail Polish for FREE* ** just pay shipping & processing charges of $10. Create an account on Zoya.com if you do not already have one.. Add at least (3)Zoya Nail Polish shades to your shopping cart, along with any additional items you wish to purchase. Shipping & Processing Fee of $10 applies. 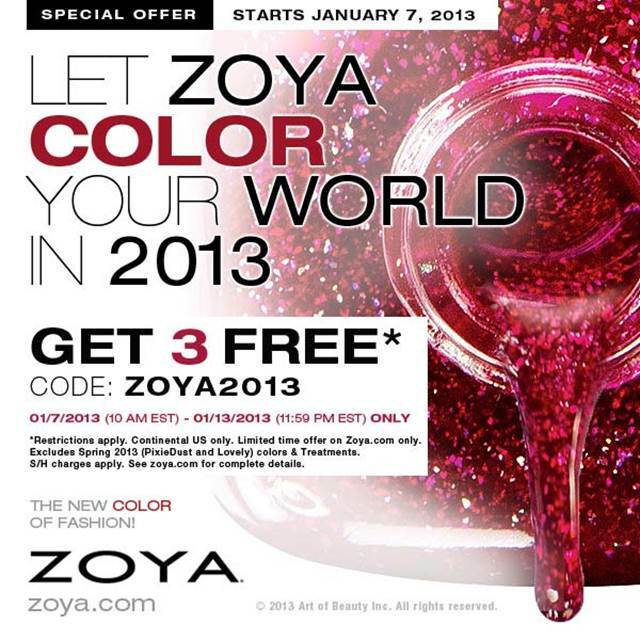 Valid online atwww.zoya.com 10 AM EST, 01/07/13 through 11:59pm EST, 01/13/2013. Continental US only. Not valid in conjunction with other coupons, codes or promotions. Returns or exchanges of promotional items not permitted. Art of Beauty is not responsible for incorrect addresses, credit card entry errors or errors associated with declined credit cards . Code must be entered at the time of purchase. Please allow up to 4 weeks for shipping if volume warrants it. Limit 1 promotional order per account. Too bad it's for the US. Hmph. oh wow ! huum look too beautiful to be real :P hope canada is in this promotion! Got my shopping cart loaded and ready! Was able to redeem right now on Friday night, but the website is extremely slow. Took a 1/2 hr to process, but I was multi-tasking, so let it just sit there and do it's thing.